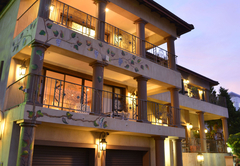 The Vineyard on Ballito is a 4 star graded hotel offering Ballito accommodation in 7 guest rooms. 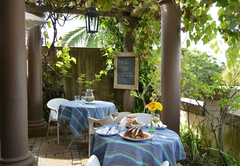 The Vineyard on Ballito is inspired by the beauty and grandeur of the magnificent South African Vineyards and the country’s viticultural history. 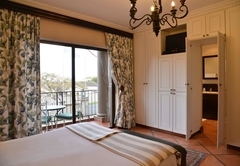 Located 5 minutes from the beach, The Vineyard offers the perfect North Coast stay with Bed & Breakfast accommodation in luxurious suites with ocean views. With a treasure-trove array of superb South African wines to enjoy, the weary traveller is sure to find himself in estate of bliss! Guests will be charmed by the thoughtful touches peppered throughout this home which invites you to kick off your shoes and unwind. 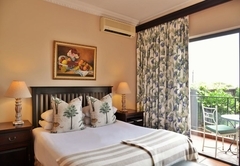 Our bedrooms are all luxurious and cater for your every possible need. 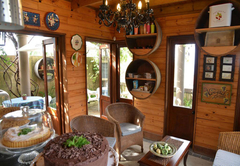 You will discover that the pursuit of supreme comfort has been our vendetta while creating these wonderful rooms which are all decorated in a sophisticated manner. 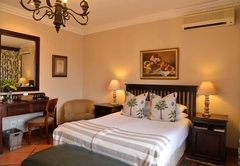 Though we have retained the best items throughout each suite, (each room has fine percale linen and bold chandeliers), each bedroom is individual in that they have their own unique trims and are each named after a great South African Wine Estate. 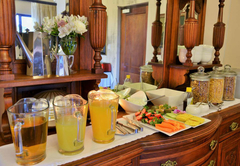 You will find all the amenities you would expect including; Tea & Coffee making facilities, M-Net and Satellite Television, Bath and Shower, Clean Linen and Towels, Candles, Bath Salts and Oils, a bar fridge with snacks and drinks and complimentary Sherry. All of our suites are air conditioned and most of our rooms have stunning Ocean views, where guests can witness whales or dolphins at different seasons. For those visitors who may be disabled, we have a room which is built specially to cater for your needs. 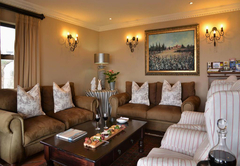 At The Vineyard you will find a range of services and conveniences which will add to the comfort of your stay. A telephone is supplied in your air-conditioned suite. We offer extensive knowledge of the area and the arrangement of tours and shuttles upon your request. 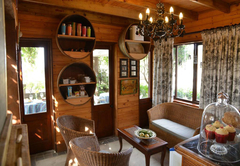 At this superb establishment you are welcome to use the refreshing swimming pool, sunbathe on the deck chairs, read the daily newspaper in our cozy lounge or let your mind sink into a great novel while you yourself sink into a comfy chair upon the veranda. 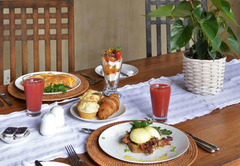 Our breakfasts are served daily and we offer a choice of a Continental and English Breakfast. 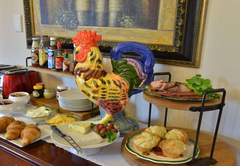 For those guests who really don’t want to go out, light lunches and wine are generally on offer. 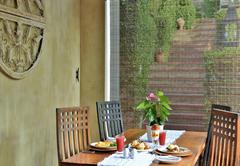 A secluded garden venue is the ideal setting for intimate weddings of between 15 to 20 people. 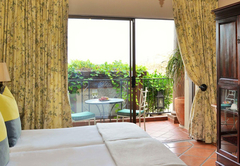 Our romantic honeymoon suite, with private balcony, sweeping sea views, jet bath and twin shower provides the perfect getaway for special occasions. Located 45kms North of Durban, Ballito is known as ‘The Pearl’ of the Dolphin Coast since it is found in the heart of this glorious stretch of Coastline. This bustling town is flanked by golden beaches and the warm Indian Ocean to the East. Founded in 1953, Ballito (which is Italian for ‘Little Ball’) is well known for its superb and safe beaches. Willard Beach offers day bathing and a lifeguard while being secured with Shark netting. The other beautiful beaches include Salmon Bay, Thompsons Bay and Clarke Bay. 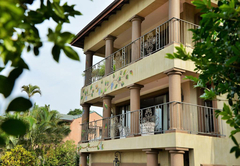 The atmosphere in Ballito is friendly and much like a village, though it still offers the modern facilities and services that holiday makers and residents would expect in a big city. There are modern supermarkets, shopping centres, movie theatres and a textural list of dining options. Luxury room on the ground floor. 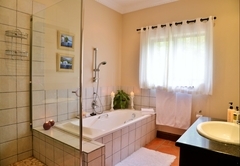 Twin beds which can be converted into a King size bed, en-suite bathroom with separate bath and shower, tea and coffee making facilities, honesty bar, TV with selected DStv (satellite) channels, Wi-Fi. Luxury sea facing room on the top floor. 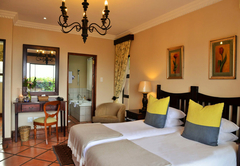 Twin beds which can be converted into a King size bed, en-suite bathroom with separate bath and shower, tea and coffee making facilities, honesty bar, TV with selected DStv (satellite) channels, Wi-Fi. Luxury sea facing room on the top floor. 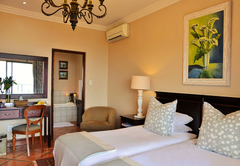 Queen size bed, en-suite bathroom with separate bath and shower, tea and coffee making facilities, honesty bar, TV with selected DStv (satellite) channels, Wi-Fi. Not suitable for a couple with child. Sea facing Honeymoon suite on the top floor. 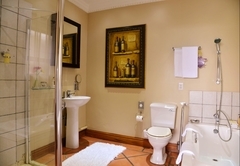 King size extra length bed, en-suite bathroom with separate bath (jacuzzi bath) and shower, tea and coffee making facilities, honesty bar, TV with selected DStv (satellite) channels, Wi-Fi. Standard Sea Facing Room on the ground floor. Queen size bed, en-suite bathroom with separate bath and shower, tea and coffee making facilities, honesty bar, TV with selected DSTV (satellite) channels, Wi-Fi, Balcony. Near Reception and Public Areas. Thank you for a wonderful stay! We coudn't have chosen a better place to stay for our first night as a married couple! We will be back! What a wonderful venue. I used the Vinyard on the day of my wedding first to get ready there. They were accomodating and made my day trully special. The first night of our lives together. We are about the celebrate our 2nd aniversary but i thought when i came across this site i had to say just how special this little piece of heaven is. We will definatly return in the future. 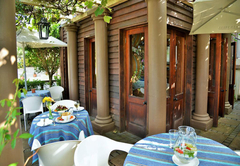 Response timeThe Vineyard on Ballito typically responds to requests in 5-10 minutes.